Hafback LeVeon Bell (26) and the Pittsburgh Steelers clinched the AFC North in Week 14 and maneuvered into the No. 3 spot in this week's report. 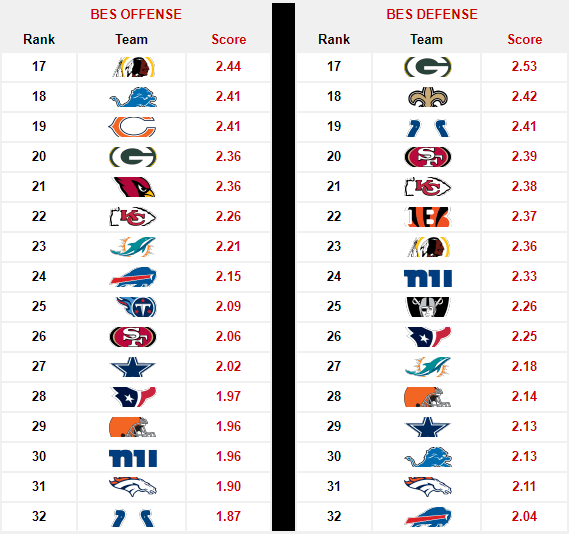 As the playoffs draw closer, our Week 14 BES Rankings arrive with movement in the top-10. The Minnesota Vikings (10-3) and Philadelphia Eagles (11-2) hold the No. 1 and No. 2 spots respectively for a second straight week. Meanwhile, the Atlanta Falcons (8-5) jumped to No. 10, joining the Carolina Panthers (9-4) and New Orleans Saints (9-4) in a trio of NFC South representatives in the BES Top-10. 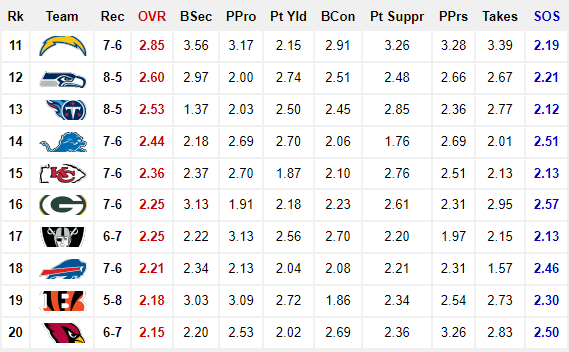 NFC South, Best in the BES – The NFC South paces all divisions with a combined BES Overall score of 2.68. 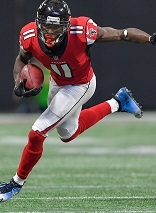 The division features three teams – Saints, Panthers and Falcons – in the BES Top-10 and has a combined record of 30-22. With the Saints and Panthers currently tied for first place and only a game ahead of the Falcons, it appears the division champion won’t be determined until Week 16 or 17. Regardless, whichever team emerges with the NFC South title will be a daunting opponent in the NFC playoffs. 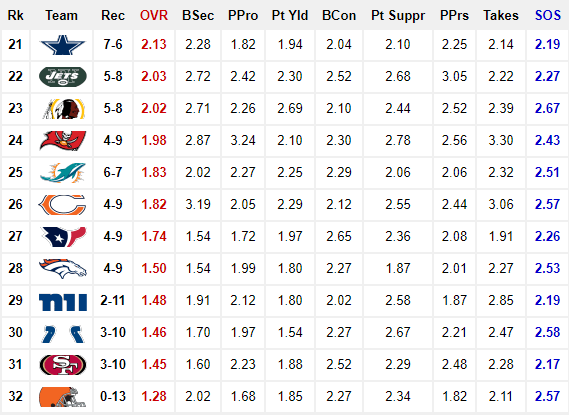 Jaguars Crack the Top-5 – If there’s a team worthy of the “Squad that Nobody Wants to Face in January” label, it’s the Jacksonville Jaguars (9-4) who claimed the No. 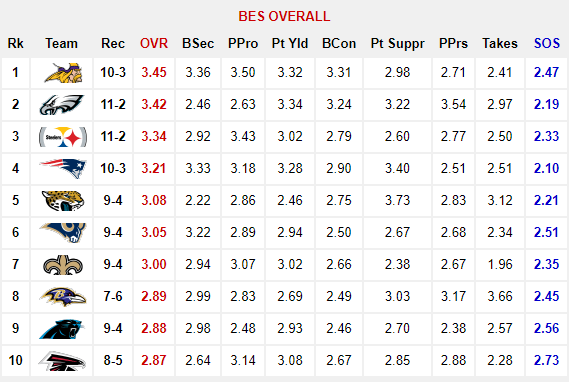 5 spot in BES overall this week. Anchored by No. 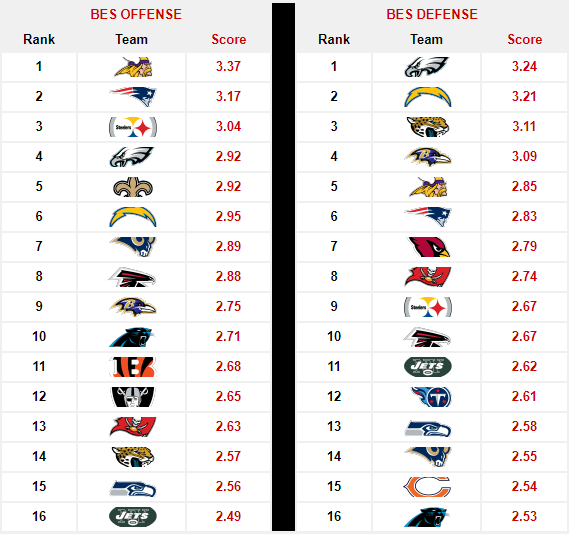 3 BES Defense, the Jaguars have become explosive on offense as well. The unit is averaging 28 points per game in their last three contests. 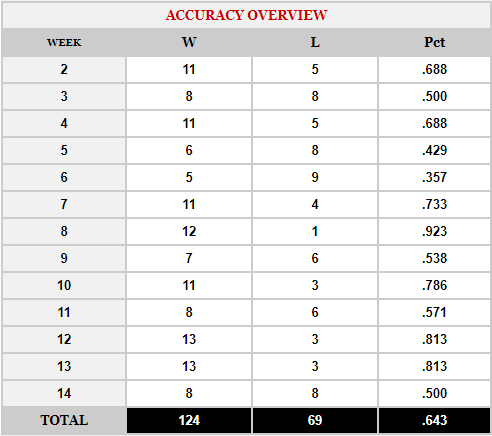 More specifically, the Jaguars also feature league’s top ground attack, averaging 149.0 yards per game. Overall, they’re a dangerously balanced team and a serious postseason threat. Patriots (No. 4) @ Steelers (No. 3): The Patriots (10-3) got derailed by the Dolphins (6-7) in Week 14. Will the return of star tight end Rob Gronkowski (suspension) get them back on track against the Steelers (11-2)? Chargers (No. 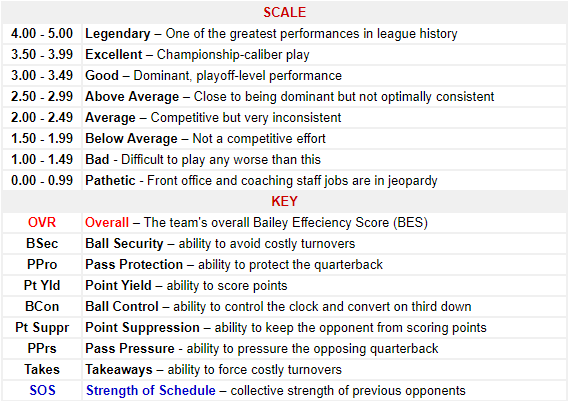 10 ) @ Chiefs (No. 15): The Chiefs (7-6) have a bit of momentum coming off their sound 26-15 defeat of the Raiders (6-7). But will it be enough to extinguish the white hot Chargers who are 7-2 in their last nine games?